PHILADELPHIA (AP) Philadelphia’s first Super Bowl parade provided catharsis Thursday for hundreds of thousands of Eagles fans, deliriously joyful after decades without a title and relishing the national spotlight on a team that few outside the city thought could win it all. Fans clad in Eagles green jammed the streets from dawn near the stadium to an afternoon rally at the city’s famed ”Rocky” steps, lining up 20 deep in spots to catch a glimpse of the champs. The Eagles rode in open-top double decker buses to the art museum that Sylvester Stallone made famous for a rally nearly 60 years in the making. And so did football-crazed Philly – desperately. Until Sunday’s 41-33 victory over the favored New England Patriots, the Eagles remained the only team in their division without a Super Bowl title – an ongoing humiliation that gave Philly an inferiority complex and made Eagles fans an easy target for fans of other teams, especially the rival Dallas Cowboys and New York Giants. The parade began at the Eagles’ stadium complex and slowly made its way up Broad Street past the cheering throngs. 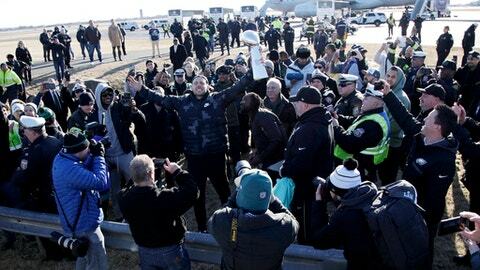 Carrying the Lombardi Trophy, coach Doug Pederson walked part of the route – allowing fans to touch the gleaming hardware – while Lurie held a sign saying ”THANK YOU FANS” as he stood next to the team’s three quarterbacks: Foles, injured starter Carson Wentz and third-stringer Nate Sudfeld. ”They are more than heroes. They’re legends. They’re immortal in this city, forever,” Tarvin said. Terry Gallen, a fan from Glen Mills, in the Philadelphia suburbs, said he ”broke down like a baby and cried” when the Eagles won the Super Bowl. But it was the crowd-pleasing Kelce who best channeled the gruff but ultimately good-hearted ”attytood” for which Philadelphians are famous. He then led the crowd in a jolly – and filthy – chant set to the tune of ”My Darling Clementine”: ”No one likes us, no one likes us, no one likes us, we don’t care!” The big-bearded lineman uttered at least two profanities that made it onto live TV, recalling Chase Utley’s similarly profane speech at the Phillies’ World Series parade 10 years ago. And for Natasha Curley, 31, a janitor from Trenton, New Jersey, the Super Bowl title means that rival fans can stop their yapping – at least till next season.